The drawing shows a single snake's-head fritillary stem and flower. It is surrounded by a rectangle, sketched roughly in graphite, indicating where the edges of the window-mount should lie. The drawing was first catalogued in in 1870, when Ruskin included it as no. 9 in the Educational Series in the Catalogue of Examples, as "Lily, for Artemis". By 1871, it had been re-numbered to 9, and more clearly entitled "Field Lily of Oxford. (Drosida Ælfredi, Alfred's Dew-flower)" - Ruskin's names for the snake's-head fritillary. The following item, no. 9 B, was a nearly-identical study of the same flower, but done in graphite alone. The drawings were placed in Case I of the series, devoted to "Introductory Subjects, and Exercises in Flower Drawing". They remained in the same position in the 1874 catalogue of the series, but were renumbered as 13 and 14. This drawing remained in the series, with the same number, in Ruskin's 1878 reorganisation, although no. 14 was replaced by a drawing of a blue iris (now listed as Working Series, Case II, no. 23). of the series. A similar study was included in the Rudimentary Series as no. 236. In his entry for the drawing in the 1878 catalogue of the Educational Series, Ruskin noted that it was well-painted - in other words, that the colour was well-depicted, although the outline was 'utterly blundering and clumsy'. 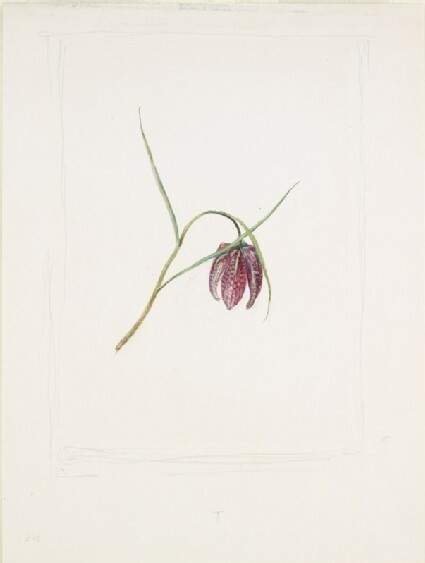 In the instructions related to the drawing in his two printed catalogues of the series, however, Ruskin seems to have been more interested in the fritillary's relationship to other plants, calling it the best wild type of the true lily, exemplifying the connection between lilies and rushes (and from rushes to sedges and grases): the flower's speckled head was intended to emulate the granulated heads of grasses - a point to which he returned on pp. 34-35 of the printed catalogues of the Rudimentary series. He referred his students to "The Queen of the Air", where he had explained that the flowers which he called 'Drosidae' - dew-flowers, which included lilies, asphodels, amaryllids, irids and rushes - were 'the origin of the loveliest forms of ornamental design, and the most powerful floral myths yet recognized among human spirits' (§ 81 = XIX.372; cf. §§ 79-81 = XIX.371-372). The Oxford lily; also painted as well as I can. When a Study is said to be well-painted, the student must remember that Colour is always the principal object in it. By comparing the grass-blades (for we may so call them) which are glorified by their depression into this purple bell, with the simple grass of the 6th study , the student will at once see the difference between a study made for what Artists call 'Drawing' and one made for Colour. There is nothing in the outline of No.13. which is not ut terly blundering and clumsy compared to the point work in No. 6; but the gradations of warm and cold colour and their minglings with shade, as for instance where the stalk expands into the bell, require far more general skill and attention than the mere guidance of the lead-point in the area of work.